Obligate scavenging is very rare in the animal kingdom, due to the difficulty of finding enough carrion without expending too much energy. In vertebrates, only vultures and possibly some pterosaurs are obligate scavengers, as terrestrial soaring flyers are the only animals able to find enough carrion. Most scavenging animals are facultative scavengers that gain most of their food through other methods, especially predation. Many large carnivores that hunt regularly, such as hyenas, but also animals rarely thought of as scavengers, such as African lions, leopards, jackals, and wolves will scavenge if given the chance. They may also use their size and ferocity to intimidate the original hunters (the cheetah is a notable exception). 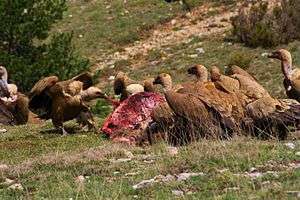 Almost all scavengers above insect size are predators and will hunt if not enough carrion is available, as few ecosystems provide enough dead animals year-round to keep its scavengers fed on that alone. 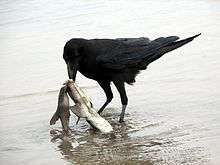 Scavenger wild dogs and crows frequently exploit roadkill. In the prehistoric eras, the Tyrannosaurus rex may have been an apex predator, preying upon hadrosaurs, ceratopsians, and possibly juvenile sauropods, although some experts have suggested the dinosaur was primarily a scavenger. The debate about whether Tyrannosaurus was an apex predator or scavenger was among the longest ongoing feud in paleontology; however, most scientists now agree that Tyrannosaurus rex was an opportunistic carnivore, acting mostly as a predator but scavenging when it could. Recent research also shows that while an adult Tyrannosaurus rex would energetically gain little though scavenging, smaller theropods of approximately 500 kg may have potentially gained levels similar to that of hyenas, though not enough for them to rely on scavenging. 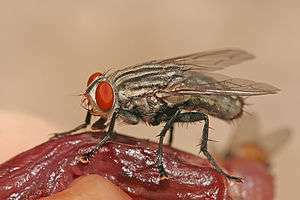 Animals which consume feces, such as dung beetles, are referred to as coprovores. Animals that collect small particles of dead organic material of both animal and plant origin are referred to as detritivores. In humans, necrophagy is taboo in most societies. Many instances have occurred in history, especially in war times, where necrophagy was a survival behavior. In the 1950s, Louis Binford suggested that early humans were obtaining meat via scavenging, not hunting. In 2010, Dennis Bramble and Daniel Lieberman however proposed that early humans used long-distance running to hunt, pursuing a single animal until it died of exhaustion and hyperthermia. Such behavior has been suggested as an adaptation to ensure a food supply that in turn made large brains possible. The eating of human meat, a practice known as anthropophagy (and known across all species more commonly as cannibalism), is extremely taboo in almost every culture. Scavenger appears as an occupation in the 1911 Census of England and Wales. This job title was used to describe someone who cleans the streets and removes refuse, generally a workman (a modern-day garbage collector, janitor, or street cleaner) employed by the local public health authority. Young people in developing countries revert to scavenging to develop entrepreneurship skills in order to operate in hostile economic contexts. In India, the term "manual scavenging" is used to the removal of raw (fresh and untreated) human excreta from buckets or other containers that are used as toilets or from the pits of pit latrines. The excreta are piled into baskets which the workers may carry on their heads to locations sometimes several kilometers from the latrines. The employment of manual scavengers is officially prohibited in India since 1993 but is still taking place to this day. The name is properly "scavager" or "scaveger", an official who was concerned with the receipt of custom duties and the inspection (scavage) of imported goods. The "scavagers" are found with such officials of the City of London as an aleconner or beadle. These officials seem to have been charged also with the cleaning of the streets, and the name superseded the older rakyer for those who performed this duty. These professions are essential to urban settings operating at the highest capacity. 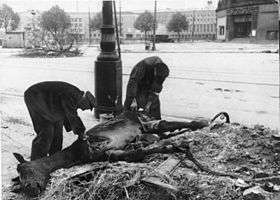 The garbage collection jobs and scavenging professions allow urban populations to continue unhindered by outbreaks and disease most commonly brought by the build-up of physical waste. These jobs were of the most importance before the time of functional sewer systems and indoor plumbing. ↑ Getz, W. (2011). Biomass transformation webs provide a unified approach to consumer–resource modelling. Ecology Letters, doi:10.1111/j.1461- wtf0248.2010.01566.x. ↑ Binford, Louis. R. (1986) Human ancestors: Changing views of their behavior. Journal of Anthropological Archaeology 3:235-257. ↑ "Human rights and manual scavenging" (PDF). Know Your Rights Series. National Human Rights Commission. Retrieved September 16, 2013. ↑ "Cleaning Human Waste: "manual scavenging", Caste and Discimination in India" (PDF). Human Rights Watch. 2014. Retrieved 23 June 2015.